Senator Tom Cotton sent a letter to the Commissioner of the Internal Revenue Service on Tuesday urging him to investigate whether the Southern Poverty Law Center should retain its tax-exempt status as a 501(c)(3). "Recent news reports have confirmed the long-established fact that the SPLC regularly engages in defamation of its political opponents. In fact, the SPLC's defining characteristic is to fundraise off of defamation," Cotton's letter said. "This business model has paid well. The SPLC has accrued more than $500 million in assets. According to the group's most recent financial statement, it holds $121 million offshore in non-U.S. equity funds. The SPLC uses these assets to pay its executives lavish salaries far higher than the comparable household average." He continued: "Further, CNN reported that the organization ‘suffers from a pervasive racist culture,' and the SPLC's leader has ‘been disciplined after a prior investigation into inappropriate conduct.' The New York Times has charitably described the organization as ‘in turmoil' and cited employees' claims that SPLC leadership is ‘complicit in decades of racial discrimination, gender discrimination, and sexual harassment and/or assault.'" "Based on these reports, and in the interest of protecting taxpayer dollars from a racist and sexist slush fund devoted to defamation, I believe that the SPLC's conduct warrants a serious and thorough investigation.'" "Engaging in systematic defamation is not a tax-exempt purpose," Cotton said. "While IRS guidance lists several examples of tax-exempt purposes, engaging in defamation as a business model is of course not one of them." 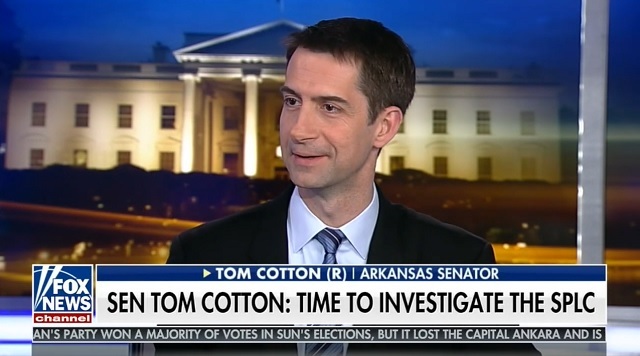 Senator Cotton also appeared on Tucker Carlson's show Tuesday night and slammed the SPLC as a "hate group" which uses their millions to "stigmatize" their political opponents. Carlson suggested Media Matters' 501(c)(3) needs to be similarly investigated.